Johnsonville Sausages – America’s favorite bratwurst, Italian sausage, breakfast sausage and smoked sausage – sought an online interactive solution to kickoff the 2009 summer grilling season. With a strong, previously established supporting audience offline, it was important to make our technological online-savvy initiatives very user-friendly. As Senior Interactive Producer for matrixx, we came up with the CreateYourOwnVille.com website. 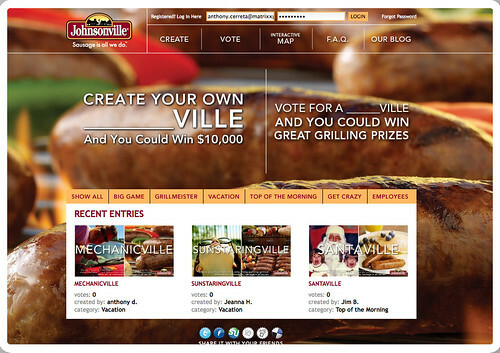 By visiting Johnsonville’s CreateYourOwnVille.com website, users are able to register and create their own ‘Ville’ for the chance to win great summer grill packages. In addition users can also submit their VILLE for a grand prize $10,000 and a chance to have their VILLE become the next Johnsonville national print ad. Upon creation a user’s photo is submitted to the interactive gallery and map for their peers to vote on. The top 5 VILLE’s of each category will be submitted to Johnsonville Executives who decide the final VILLE which will be become the next national Johnsonville ad and receive the $10,000 cash prize. Curious who won? As Senior Interactive Producer I was responsible for creating the initial campaign concepts, determining the interactive elements, drafting the initial sitemap and budgeting the entire campaign. Additionally I was involved in the creative phone brainstorming sessions between our matrixx team and Johnsonville. After getting the go ahead I was excited to work with the uber creative and innovative Tech by Design and their initial design and flow. I pulled ideas from the official Johnsonville.com website created by Tech by Design as well as my interests in cognitive psychology to create the campaign website’s sitemap and lead the team through the planning of all the technical aspects to furthered user engagement and enjoyment. I worked with the brilliant Kelly McCallion to manage our innovative creative team responsible for seeding the campaign and acting as brand ambassadors for Johnsonville’s CreateYourOwnVille.com website, the newly created Johnsonville blog, the Johnsonville branded social networks. The brand ambassadors were also responsible for answering consumer feedback, approving/denying each user uploaded photo and collecting and analyzing the underlying analytics to map offline consumers trends and practices and much, much more. Additionally, I was also responsible for managing the online banner ad creation process and monitoring the campaign’s online ads and adwords. Johnsonville’s ‘Big Taste Grill’ was one of the many mobile-branded assets that traveled across the nation to some of the hottest spots of summer such as the AVP Pro Tour here in Huntington Beach, CA. The mobile campaign ads ran during the Create Your Own Ville promotion and also encouraged texters to ‘Create Their Own Ville’ at Create Your Own Ville.com. Thousands of mobile phone users texted in to win one of many cool prizes like Johnsonville t-shirts, aprons, coupons or free game-play at Sim Dynasty, home of online fantasy simulation baseball. The campaign was also promoted and advertised using several traditional marketing channels including television and print (magazine, newspaper & direct mail). Billboards were also strategically placed across the nation to advertise the campaign. Overall the campaign has been a huge success generating millions of page views and deep brand engagements. Thousands of user generated ‘Villes’ were created, tens-of-thousands of votes were cast, tens-of-thousands of fans were connected via social networking and thousands of mobile numbers were opted-in over the few months, establishing Johnsonville consumers with deep brand engagements (on average over minutes at a time) and increasing the Johnsonville email enthusiasts club by ~100%. Additionally with the help of matrixx, the Johnsonville brand has been positively associated with Igloo Coolers and Gander Mountain through innovative prizing partnerships. 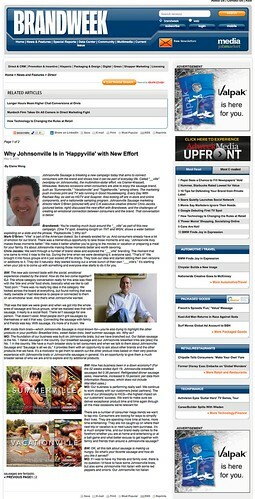 Furthermore, we were all happy to hear our efforts were globally recognized when Johnsonville CreateYourOwnville.com won a prestigious W3 award! Great job team!! Click to Visit Brandweek’s Article about the CreateYourOwnVille Campaign. Special Note: With the first initial concepts developed in July of 2008, this idea later helped establish the Schlotzsky’s Big League Clubz campaign.